The Cat on My Head’s Cooper & Two Spoiled Cats’ Teddy are Cat Scouts. Yesterday was a big day at Cat Scouts. It was a celebration for the patrols, most of which are having their third anniversary. But for our family and Angel Scout Sammy’s, we had even more to celebrate. Yesterday Teddy Kimmell and Cooper Murphy Blue officially became Cat Scouts. In honor of that Cooper wanted to show himself in his uniform. And he invited Teddy to join him. So…drumroll, please…may I present the newest Tenderpaw Cat Scouts, Cooper Murphy and Teddy. Are these two little ginger peas in a pod, or what? I just hope Sammy and I can keep them from getting up to too much mischief. They will be Worldwide Wildcats with Sammy and I, but they will be in different Patrols (Teddy with Sammy in Raz’s Rumblers and Cooper Murphy with me in Wolverines). With any luck we can keep the shenanigans at bay. We know this isn’t a true two-fur selfie as the boys are in separate photographs, but we hope you’ll accept this bit of poetic license. Now on to the hop. As it says above, this is week #134 of our Sunday Selfies blog hop. Plant a smile on your mug and give us your best. You never know who you might meet…possibly the love of your life. I know a little bit about that. And don’t forget, all critters are welcome, including introoders! If you’re feeling lazy or grumpy, often the best way to get the job done is to coerce an intruder, that may be hanging around right outside your window, to take a selfie. To add your selfie, click on the link below. To add the hop to your blog post, use the code below. If you would do us the kindness of including our badge and/or linking back to The Cat on My Head, Kitties Blue would be most appreciative. Thanks for joining in the fun. Conkatss to Teddy boy an Cooper Murphy!! You two will take Kat Scoutss bye storm!! Spitty the Kitty recently posted… Sunday Selfie:Here Comes the Sun . . .
You two look awesome! Congratulations!! Have a great Sunday! How wonderful you look in your little uniforms! Here’s hoping you do get into some shenanigans (and share them with us!). Concats on becoming Cat Scouts!! Your uniforms are quite distinguished, as befits handsome dudes like you and Teddy! Congrats on Teddy Kimmell and Cooper Murphy Blue becoming official cat scouts. They look tremendously pawsome in their garb. Those are two adorable new Cat Scouts!! Concats to both of you!!! congrats guys! You are indeed cute ginger peas in a pod!! Yay for Cooper Murphy and Teddy! We’re behind visiting blogs, and Mommy started a Sunday job so our selfies will be sporadic. But we wanted to stop by and say hi! Way to go boys, y’all look great in your uniforms!!! 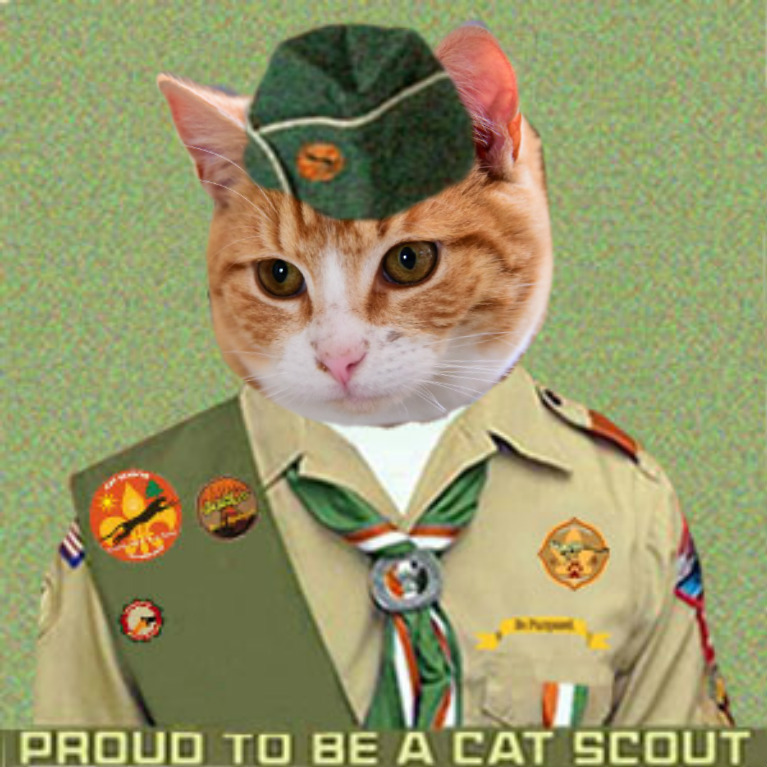 A big concats to tne newest Cat Scouts! Boy we girls sure love a boycat in uniform! Meow! Congrats to the newest Cat Scouts! pee ess…Wally apologizes for missing the event yesterday. He thought it was today for some reason. Oh well…. Me and Einstein had such a great time with Cooper Murphy and Teddy at Cat Scouts. These two young cats will make great Scouts in the years to come and we thanks the Kitty’s Blue for introducing them to all our friends! Hello Cooper Murphy! Hello Teddy! We look furward to you two strutting your stuff in time to come! YAY! We had a blast at Scouts yesterday and it was so pawsome to welcome Cooper Murphy and Teddy to Scouts! We love how they look in their uniforms! Hooray for Cooper Murphy and Teddy! You boys are going to be such purrfect additions to the Cat Scouts. Just don’t have *too* much fun, or else Mau and Sammy will have their work cut out for them. Anyway, concatulations to the two new Cat Scouts! 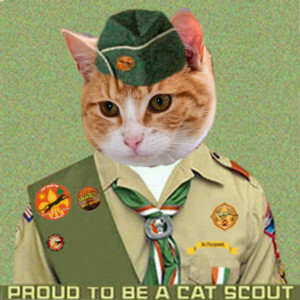 You look very smart in your Cat Scout Uniforms. We hope you will both be very handsome and made us go all silly. Tenderpaw Cat Scouts is very lucky to have gingers Cooper Murphy and Teddy. We love the thought of you guys getting together and don’t you look the coolest tenderpaws we ever saw! Congratulations on becoming TenderPaw Scouts. Sometimes I think I’d like to get back in again, but then M reminds me that she couldn’t keep up with everything the last time I was involved. It was fun, but she just can’t sit that long anymore. Arthur refuses to be a scout, he hates the hat !! Many congratulations guys, mew both look fabulous! It sure was a BIG day yesterday – Teddy and Cooper becoming Scouts….Teddy’s first birthday…..and a BIG “do” at Cat Scouts to celebrate 3 years. Today is a DAY OF REST. I think we sickretaries and secretaries alike need it! Enjoy…….Happy Sunday! That is a nice double selfie to welcome to new Cat Scouts. speedyrabbit recently posted…Sunday Selfies and the answer to Fridays Question! Happy Sunday Selfie to you all, and, to Miss Janet. Congratulations to the new Cat Scouts. My, you two lads look so very dapper in your new uniforms! Congratulations on becoming Cat Scouts. I’m sure with Sammy on patrol with you, things will be pretty much in control…. You two mancats make handsome Cat Scouts! Hope your Sunday is an easy one. Concatulations to the new Cat Scouts. There is something about a mancat in uniform that makes Trixie go all fainty (mol). Cooper Murphy you are a stunning Cat Scout as is Teddy Kimmel. Love ya boys. 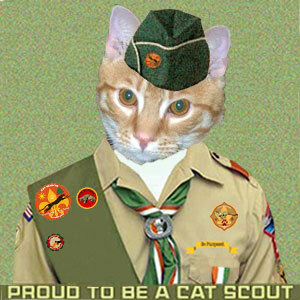 Cooper Murphy and Teddy, you two sure look awesome in your Cat Scout uniforms. We’re loving your selfies!